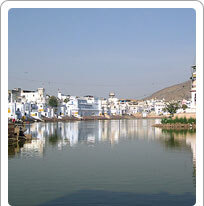 The holy Pushkar Lake is one of the important pilgrim places of Hindu religion. A dip in the lake is believed to wash away all sins and free a person from the reincarnation cycle. The lake has fifty two bathing Ghats and more than four hundred temples in the surrounding town of Pushkar. Constructed by the various Princely rulers of Rajasthan, some of these Ghats also carry their names. The Gau Ghat is the main Ghat. Ashes of Mahatma Gandhi were sprinkled in the lake from this Ghat. The Brahma Ghat is called so because it is believed that Lord Brahma himself offered prayers at this Ghat. The Varaha Ghat is named after the Varaha (Boar) incarnation of Lord Vishnu. The lake comes alive in the month of Kartik when million come here to take a dip on Kartik Purnima (October - November). During this period, the lake and the town are also the destination for the famous Pushkar Fair, extremely popular among tourists.